Easy, attractive prairie grass. Great fall color. Not invasive. Provides food and habitat for wildlife. New growth slow to show in spring. This is an attractive prairie grass especially useful for those who interested in native plantings. Coloration includes blue and green hues. The leaves turn orange and red in the fall and are topped with fluffy silver-white seed stalks. 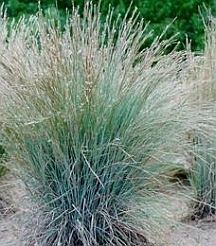 Little bluestem grows best on medium and dry soils in sun or light shade. It reaches two to three feet high. It is a 'warm season' grass. New growth in the spring appears much later than the common lawn grasses.